My love affair with water began at a very young age. 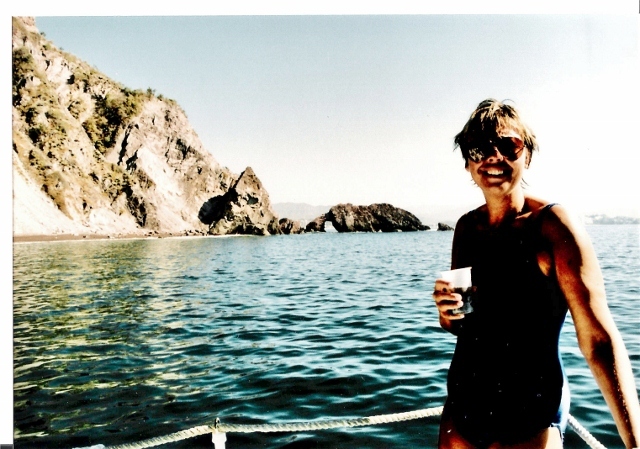 The Summer before I started school, my family camped across B.C. to visit cousins in Vancouver. One of our overnight stops was at peach orchard in Naramata, BC, on Lake Five in the Okanagan. I discovered sandy beaches and shallow lakeshores and warm, fresh water. I loved it. 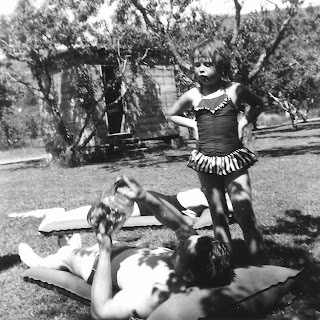 Me, at the precocious age of 6, in the first bathing suit I recall... it was red and white. A few years later, I took a series of beginner's swimming lessons at an outdoor pool in our neighborhood... and by neighborhood, I mean that the swimming pool was close enough that I could travel there on a city bus without having to transfer! I took those lessons one Summer while on vacation from school... perhaps grade 4 or possibly 5. There were 10 of them. I went for 10 days in a row... the swimming lesson lasted about half an hour and then my pool pass was valid for the rest of the day. So, I took my lunch along and basically had my Summer vacation that year, at the pool, along with all of my friends. I know I learned to float there... and also to tread water. Those skills have stayed with me all of my life. But I don't remember really learning to swim. I have always been very good at the dog paddle, which I think is basically because I love dogs so much... it is an affinity thing. And it has served me well enough. The next Summer I put my teeth through my bottom lip when I hit my chin on the side of an outdoor pool in Gull Lake, Saskatchewan... tormented by older cousins who were good swimmers, I was goaded into learning something called a Seal Dive. 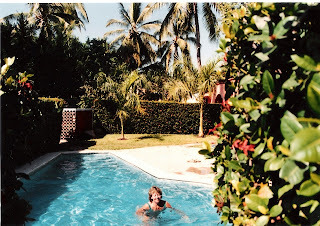 Throughout the following many years I did sort of enjoy trips to various swimming pools wherever I have travelled. I like to paddle around and play and splash to cool off and enjoy the sunshine. And I have admired the athletic souls who swim laps in the early morning before ordering the first cocktail of the day. In our private villa pool at the Krystal Hotel in Puerto Vallarta. As for swiming in lakes and the ocean? Not so much. I learned that there are leaches in the shallower prairie lakes, and that the water is too cold in mountain lakes. The sea is just too salty for my tastes and the sand can be annoying and dirty. I don't even like to lay on a sandy beach. I do love to run on the beach, and walk or hike along the shoreline.... and occasionally I will even wade into the surf. But swim, no thank you. I have, against my better judgment, been talked into little snorkelling outings while in Mexico and in the Bahamas. One time I encountered morray eels, another manta rays. Yikes! I have also developped the very difficult skill of screaming through my snorkel while underwater! Sure I will come along for the boat ride while the rest of you go snorkelling. I do not swim in either a lake or the sea if given a choice. At least without fins. There are things there, you see, that I am sure want to eat my toes! I have seen them with my own eyes and you cannot convince me otherwise. Yes, give me a good old lightly chlorinted outdoor swimming pool anyday. 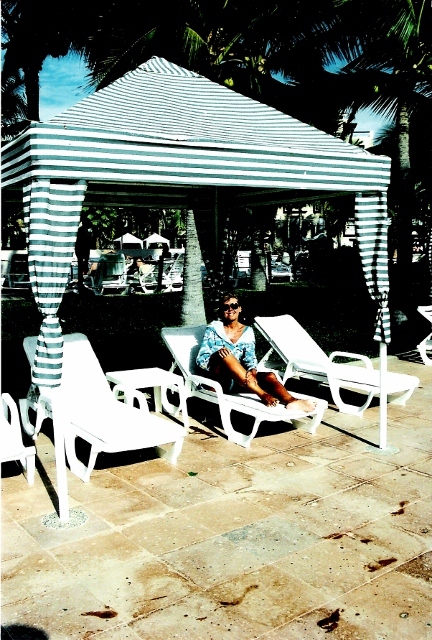 Doing some of my best work in Nuevo Vallarta at the Sierra Hotel pool. 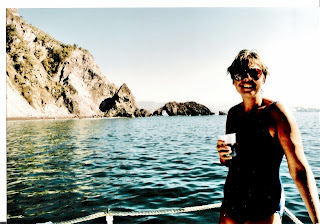 After I bought the sailboat, I decided I should probably learn how to swim in case I ever fell off the boat. So, I took a series of adult beginner's lessons at a local indoor complex. Lovely it was, but because it was indoors, it reeked of chlorine and other chemicals and I hated it and the flourescent lighting. And I barely passed the the course and got my certificate, because it was all I could do to drag myself there one day a week between lessons to practice. I hated to have to drive to the pool, change into my bathing suit, shower, swim, shower, change, dry my hair, and then drive home. It was so time consuming and such a huge effort. And in a Northern climate, from November through March, very, very unappealing. The Captain and I did house and dog sit, for a couple of winters fairly recently, for a nice couple who winter in Mesa, AZ, and they have an outdoor pool... and we did look after their giant golden-doodle pooch for several days in July one of those years and so were able to splash around in the pool.. but swim? I did try to practice a bit but not on a consistent basis. But since moving off the sailboat and into this apartment, we have been blessed with a lovely, clean, warm outdoor pool... and it is hardly ever used! It is shared by 2 buildings, each having 13 floors of suites... but we have never run into more than 3 or 4 other people there, and most of the time we have it to ourselves. Joy. I can put on my bathing suit in the privacy of my own home, cover up, and walk down the hall, open the outside door and go for a swim, dry off and walk back down the hall to my own home, strip, shower and get dressed. Love that. This is the Summer I am really learning to swim! We have been going to the pool a few days each week and for the first several times, I just did my usual dog paddling... but really worked at it. And then gently, but assuredly, The Captain started giving me some coaching and some suggestions... and lo and behold I am actually swimming! And I am loving it. And I getting pretty darn good at it. Well, he says I am, and I feel like it is getting easier. Under the little bridge to a small tanning island in the pool. At least I am moving myself across the pook without gasping for air and reverting to my dog paddle or flipping over on my back and floating. I am learning the crawl and the backstroke, and when I get really tired, I am doing a sidestroke. The Captain knows me well enough to be very encouraging and not to critique my technique too severely if he wants me to continue... this is supposed to be fun after all. And he is a great, strong swimmer and enjoys it so much that he wants me to be happy doing it as well. But I am so loving what this swimming is doing for my body! It is a great aerobic workout, there is not a shred of doubt about that... but it is also a fantastic core workout! My torso is getting leaner and sleeker and I love that. So much. And the shoulders and arms are benefitting too. And I don't hate the suntan either. I always thought that if I were to ever add an event to a run, it would be biking and I might be interested in a duathlon, But hey, perhaps there is a tri in my future? What do you think? Do you swim? 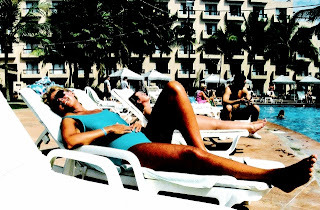 Do you suntan? I think I look healthier with a bit of a tan, although these past few years I am making more of an effort to have less sun directly on my face. That's fantastic! I'm so glad you're enjoying the pool. My mum had a rule - you do weekly swimming lessons until you get your gold swimming certificate (which involved all sorts including swimming 800m, treading water for a length of time, swimming a length with your clothes on, swimming 5m underwater, etc). I'm so glad because now I'm a real waterbaby. 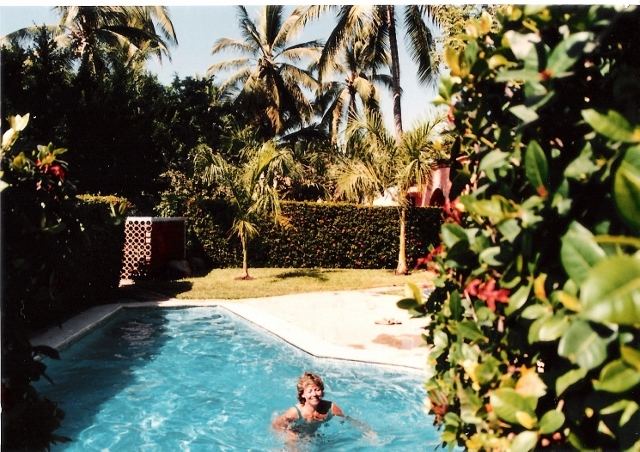 I grew up with a pool in my backyard and took daily swims for granted. Now, the only time I get to the pool is with my kids; we go down the waterslides, jump in the artificial waves and float on the styrofoam mats. I miss swimming for swimming's sake. Hmm, maybe I need to take it up again? P.S. does this mean you'll need to change your blog name to 'eat run sail swim'? Although I received all "my colors" in swimming growing up...I feel if I ever did a triathlon, it'd be my most difficult phase. I grew up not too far from Lake Champlain in NY. In fact, we had a beach in our 'hood. We'd spend every day there in the summers as it was the hangout. Me & swimming never got along and then after my parents' divorced, I dumbly jumped in the wrong end of a pool and panicked. I am still working on getting over that. I am thinking about lessons in February so I can do a tri next summer. I love the idea - we'll see how it goes! Good for you for trying to get back at it! I don't tan at all now but of course, when you're outside in the summer, you get color! Good for you!! It has taken me about 3 years (not swimming consistently) to relearn to swim. I love it. i love all the pics! i love a nice tan, but the dermatologist has nixed that for me! good for you for taking the plunge! I too am a dog paddler on my best day. 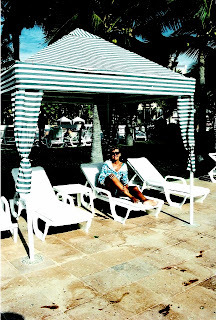 I had to be fished out of a pool at Disney with a large pole by a lifeguard. I wasn't a kid either. Oy. I am glad you are getting some new swimming skills! I grew up near a river and we were at the beach every day in the summer; we were like little otters. I never remember actually learning how to swim; it just seems like I always knew. I love swimming, anywhere, anytime! That first black and white picture is classic. I'm with you, I'm not totally crazy about swimming in the ocean because I don't want my toes to become fish food.